Alan Whicker, who has died at the age of 87, once said he was the only person who really was interested in other people's holiday snaps. It was this innate sense of curiosity that drove his career as a reporter and presenter. Over a period of five decades, he went from being a war correspondent to unearthing the impressive and bizarre in his series Whicker's World. His dapper figure, inevitably clothed in neatly pressed slacks, blazer and regimental-style tie, made him one of the most recognised figures on television. His scripts had a full quota of alliteration and puns, and his slightly nasal delivery was distinctive - and much mimicked, most notably by Monty Python. His interviewing technique was relaxed, and he never shirked an awkward or embarrassing question. The secret, he said, was to ask it agreeably. 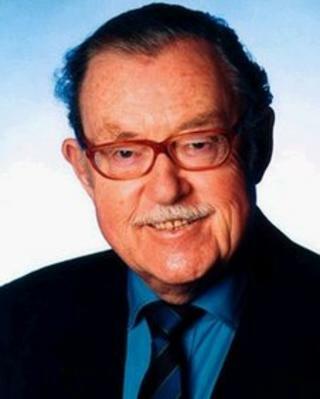 Alan Donald Whicker was born in Cairo on 2 August 1925. His family moved to Richmond in Surrey three years later. His father, a former Army officer, became ill and died soon after the move. Alan was educated at the Haberdashers' Aske's Boys' School in Elstree, Hertfordshire and joined the Army straight from school. He was commissioned in the Devonshire Regiment and worked with the Army film unit in Italy, directing cameramen - work which he loved. After leaving the Army he got a job as a newspaper reporter and found himself working as a war correspondent covering the conflict in Korea. At one stage it was reported he had been killed. But a telegram to his office - "Unkilled, Uninjured, Onpressing" - reassured his editor the despatches would keep coming. He joined BBC television in 1957 and worked on the Tonight programme, which saw him presenting a whole series of offbeat reports from a wide variety of places and countries. Two years later came Whicker's World. In a remarkable run of 30 years, first on the BBC and then ITV, he crossed continents covering a bewildering variety of topics. His list of interviews was a veritable host of the great, the good and the not so good, most notably the notorious Haitian dictator 'Papa Doc' Duvalier. Peter Sellers, Joan Collins, writer Harold Robbins and the Sultan of Brunei were among the famous figures who subjected themselves to his courteous but penetrating style of questioning. He effortlessly crossed class divides, as much at home among ordinary people as he was among the wealthy and famous. He had a natural ability to persuade his subjects to bare all for the camera. At his best he would charm his way into people's confidence, then allow them enough rope to hang themselves. In the Alan Whicker Report series he memorably interviewed Paul Getty, the world's richest man, in The Solitary Billionaire. Even Whicker later confessed he was taken aback when Getty casually mentioned during the interview that his best friend had committed suicide that very morning. In 1968 he became part of the team that set up Yorkshire Television, and Whicker's World transferred with him. He rejoined the BBC in 1982 and did four programmes from the QE2. Later came Living with Uncle Sam, about British expatriates in the United States, and Whicker's World Down Under, about Britons in Australia. At one time Alan Whicker was travelling 100,000 miles a year. He interviewed millionaires and monks, cowboys and comics. Money, or the lack of it, was a recurring theme. But all the travelling had its downside. He once said the constant travelling left many of his friendships in disrepair. One of his more memorable interviews was with Percy Shaw, who had made millions with his invention of the cat's eye reflector. Shaw was alone in an empty room, his only consolations his Rolls Royce and the bottles of beer that surrounded him. Whicker's programmes were nominated for many awards, including several Baftas, and on radio he presented Start the Week and Whicker's Wireless. In 2009 he went back to some of the locations and people he had once visited in a BBC series called Alan Whicker's Journey of a Lifetime. Whicker never married. But he once lived for three years with the millionairess Olga Deterding, who made him the beneficiary of her will. Since 1969 he shared his home in Jersey with partner Valerie Kleeman.